In my collection of cassette tapes, which my children say are left over from the Ark, is one I made during my bachelor days. It was back in 1970. The winter was cold and wet. An ice storm had split an old tree in two just down the street. I was living alone in a small town on Newfoundland’s Avalon Peninsula. My fiancee was living in an isolated village that took two hours by car and six hours by boat to reach. We were each pastoring a small Salvation Army church. While the work was rewarding, most days we sat in our separate homes, hundreds of miles apart, and ate our meals alone. That was when I decided to make my recording. I placed the cassette recorder on the table one evening as I prepared supper and had a conversation with my fiancee while dishes rattled, cutlery clanged and the kettle sang in the background. The next summer, we were married, and that was our last winter alone. 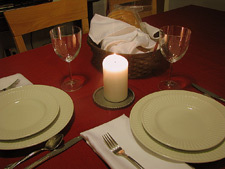 As we moved to other provinces, our place settings grew from two to three, then four, then five. When our older children graduated from high school and moved out to university and to work, the numbers changed again – to four, to three. Then there was a swinging door period when various offspring lived away and moved back home and moved out again several times. When our youngest left to spend Christmas with her fiancee, it was the first Christmas in 30 years that there were just two plates, two cups, two saucers and two knives and forks – and two people looking into each other’s eyes across a much-too-large turkey. But that year we had some things that we did not have on that first Christmas together: decades of memories and hearts filled with thankfulness to a God who had proved himself faithful beyond our deserving. Throughout the day, number one son, number two son and baby daughter phoned to see how the old folks were doing. I think they may have been a little surprised to find that we were not in tears – after all, dinner for two was what we had dreamed of in our single years. The children are all gone now, with the nearest more than 2,000 kilometers away. Perhaps it’s time to replace that old cassette with an MP3 recorder, computer and video cam – so they won’t feel too lonely. Originally published in Faith & Friends, December, 2005. Used with permission. Copyright © 2010 The Salvation Army.